According to the World Bank, the Asian region supports the food demands of 60 percent of the global population by using just 23 percent of the world’s agricultural land. Due to an increasing population and decreasing land mass, the role of technology in agriculture is key. This is where the booming start up scene in Southeast Asia could come in handy for farmers. Some developers have seen the potential of using mobile app technology as a means to revolutionize the agricultural sector by creating apps specifically for it. These apps have the potential to help farmers utilise and maximise their limited resources for a better yield of crops. Farmers in Myanmar – what are they using? In Myanmar, the agricultural sector accounts for some 28 percent of the country's GDP, but yields are low due to farmers being cut-off from modern technology under the previous regime for decades. Farmers in Myanmar are still among the country's poorest. A 2017 World Bank study found that farmers in some areas of the country still earn as little as US$2 per day. Compared to other rice-yielding nations in the region, rice paddy generation is also low in Myanmar at 23kg a day as opposed to Cambodia (62kg), Vietnam (429kg), and Thailand (547kg) respectively, a 2016 World Bank report stated. Most people in Myanmar, including farmers have smartphones. The country today has a smartphone penetration rate of 80 percent and app developers have been quick to create apps for everything ranging from healthcare to Myanmar's parliament. One game-changer among agricultural apps is the ‘Green Way’ app which was launched in 2016. The app provides farmers with up-to-date information on everything from weather and climate change to crop prices and advice on pesticides and fertilisers. There is also a chat feature on the app that allows farmers to connect with each other, allowing the exchange of information. There are also tips, as well as the availability of experts on hand to answer additional queries. The ‘Green Way’ app was created by two former agricultural students. “Green Way is my dream to link farmers and experts. The farmers can get help whenever they need," said Yin Yin Phyu, co-founder of the app to AFP. It took the two entrepreneurs five years to develop the farmer-friendly app. In order to maximise its potential, the farmer’s needs, behaviours as well as farming conditions were studied closely. The application's main goal was to make it user-friendly to farmers, as they are “…a community that is afraid to use this type of technology for fear of it being too complicated,” she added. 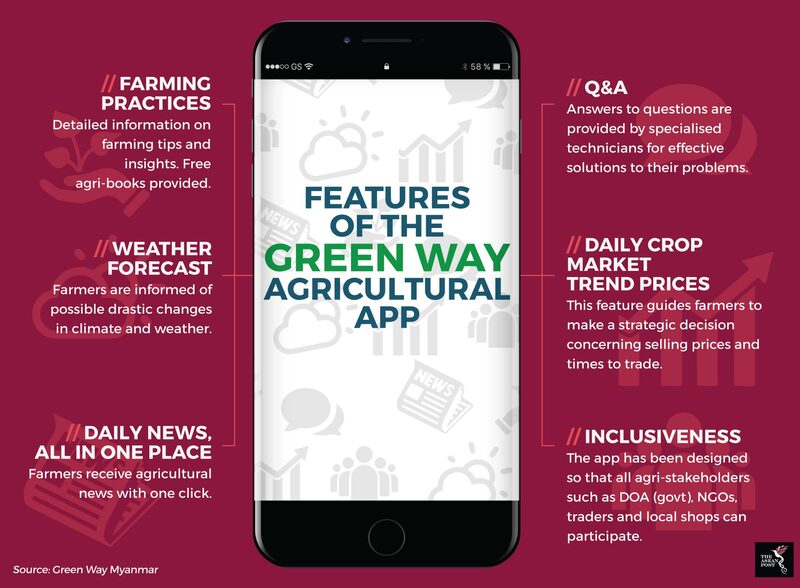 Currently, there are more than 70,000 downloads of this app by Myanmar’s farmers. Another app that’s helping farmers in Myanmar be more productive is Impact Terra’s ‘Golden Paddy.’ The Golden Paddy platform has three channels to connect and engage with farmers across Myanmar - a mobile application, a web application and a Facebook page. This app benefits farmers by providing advice on early identification of pests and diseases and flood and drought warnings. Apart from that, the app connects farmers to potential buyers and provides them with information about market prices, indirectly increasing the bargaining power of the farmers. “We realised that we were focusing too much on mass market, offering services (general advice and information) for a wide range of crops. As of this year, we have secured significant funding to focus on specific crops and to provide high level services for focus crops - mungbean, maize and paddy,” explained a representative of Impact Terra in an e-mail to The ASEAN Post. Currently, its services are only being offered in Myanmar, and the app has been live for a year. “With our significant funding, we are also starting a number of new focused and high impact projects, one being the Smart Agriculture Myanmar project in which we work with a consortium to integrate satellite data into our platform,” she said. This integration will allow farmers to get detailed and insightful information on irrigation, flooding and drought. “Once this project is up and running, the road to other countries lies ahead. The first countries on our list are Thailand, Vietnam and Indonesia, since we already have partners in these countries,” she explained further. With budding technological advances, these platforms have the potential to bring about rapid development to the region’s agricultural sector. The challenge now remains in increasing the user-base for these specialised apps. This can only come about by constantly developing the technology applied and listening to the farmers that use the app.